Entry-level office device for professionals? 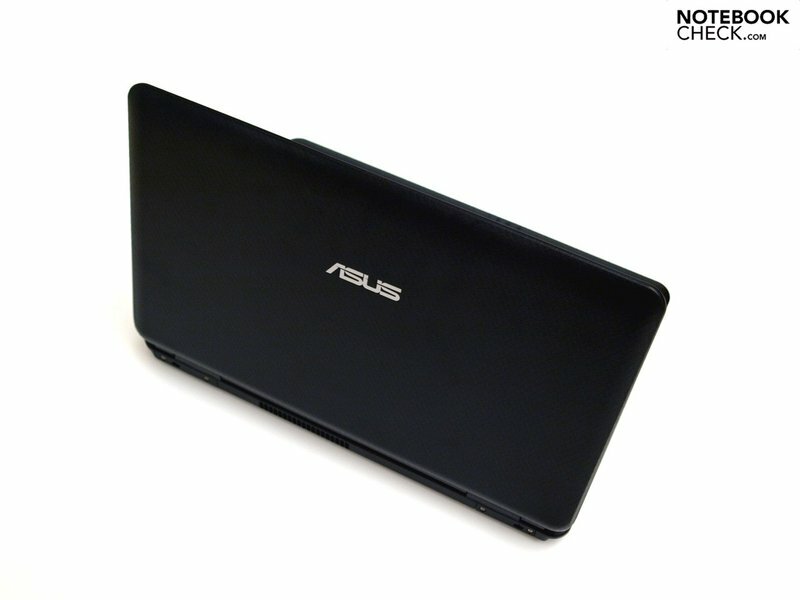 With the P50IJ, Asus has expanded its business range with another model. 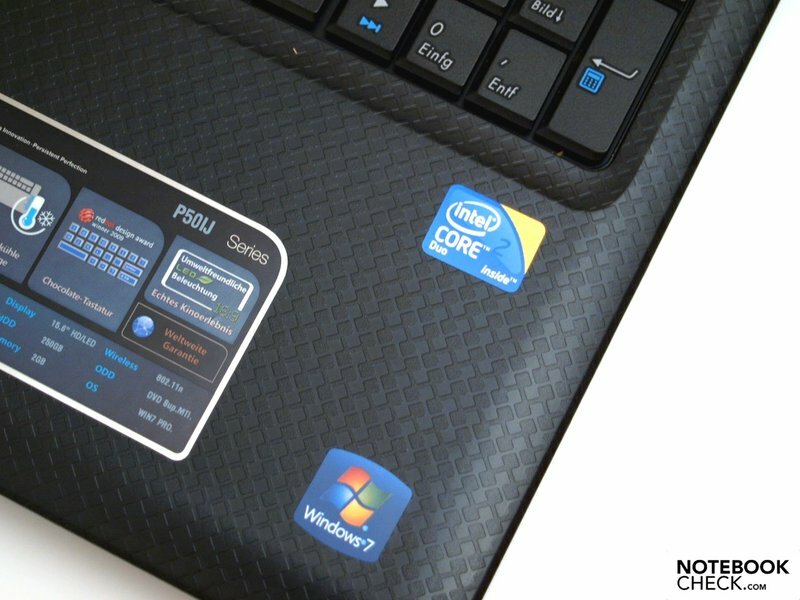 With a matte display, this system is aimed at long-term usage in the professional daily grind. In terms of performance you can expect practical performance in standard office applications. 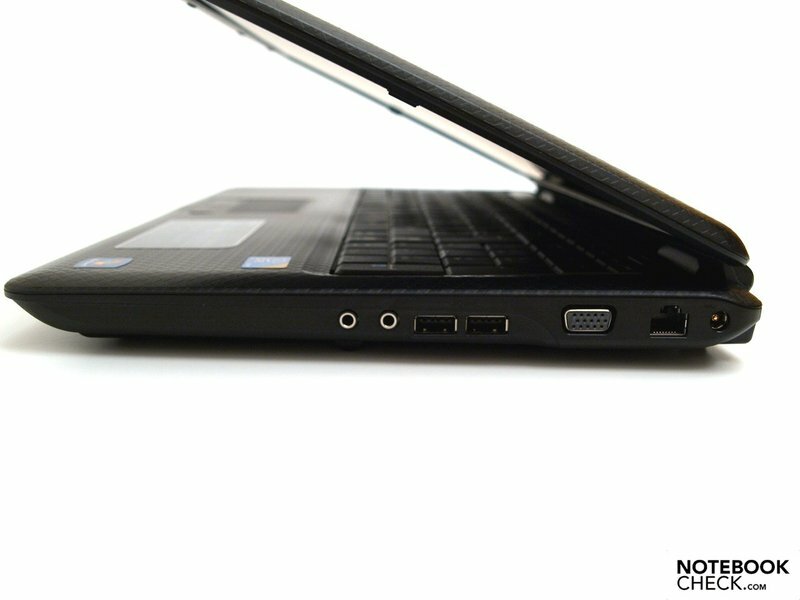 You can find out how the P50IJ turns out in our tests and how well it meets the demands of a "business device". Some time has already passed since Asus introduced its first "business" series in the form of the B50, and now the P50 series comes into the fray. 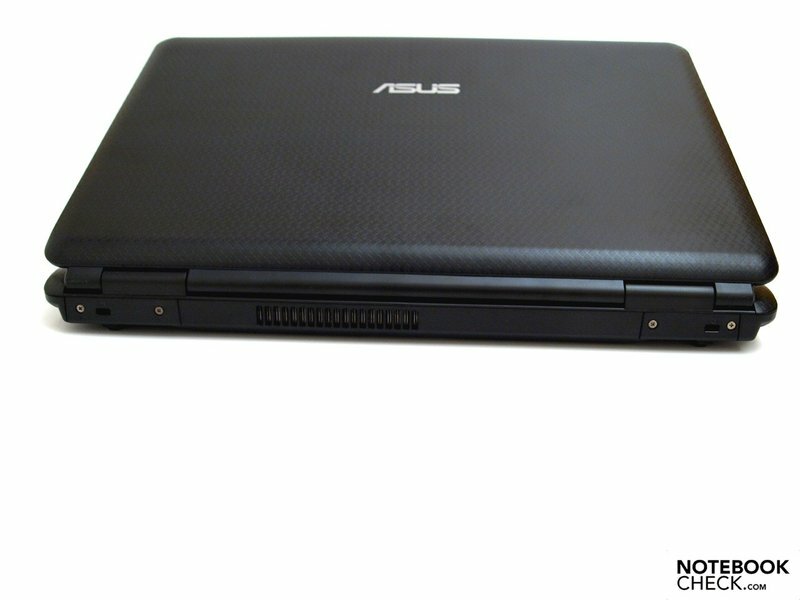 The P50IJ is currently the only notebook available in the series and after the B50A this model is Asus' second business device. 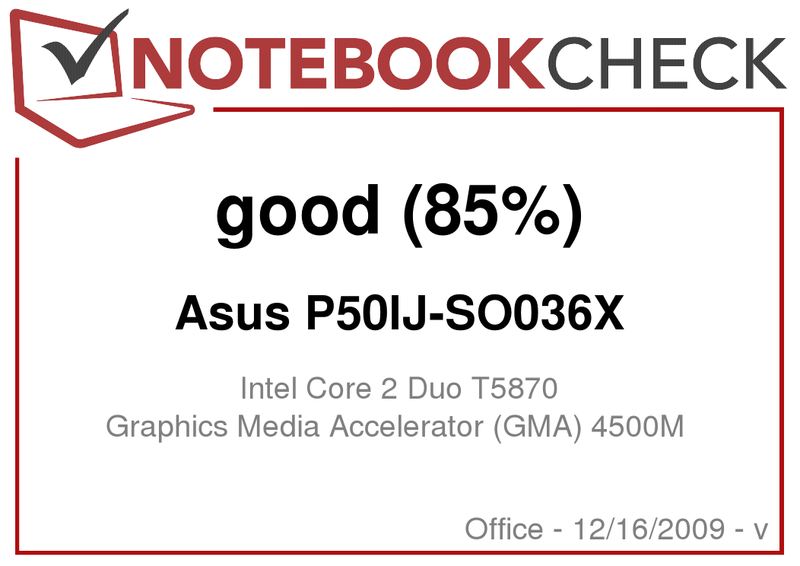 In the review we had the Asus P50IJ-SO036X, which in terms of performance is in the office domain with Intel Core 2 Duo T5870 and integrated Intel GMA 4500M. The results of the sections which depend on performance-bearing components are therefore not necessarily relevant to other models. In matte black with a texture similar to basketwork on the display lid and wrist rest area, the P50IJ is discreet and unobtrusive. Unfortunately, the imprinted inscriptions of the status LEDs are just as discreet due to being low in contrast, and so they are only easily visible in sufficient surrounding light. 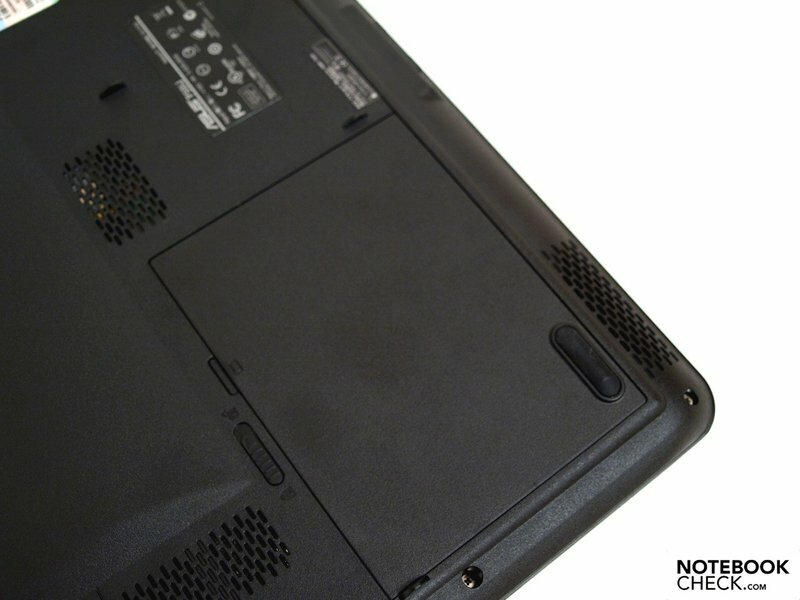 Plastic is exclusively used for the surfaces of the case. The feel is typical for the material. Due to there being no high-gloss effect, the plastic surfaces feel really pleasant and don't become dirty quite so visibly. Not only the base unit but also the display cover prove to be solid and twist-resistant. 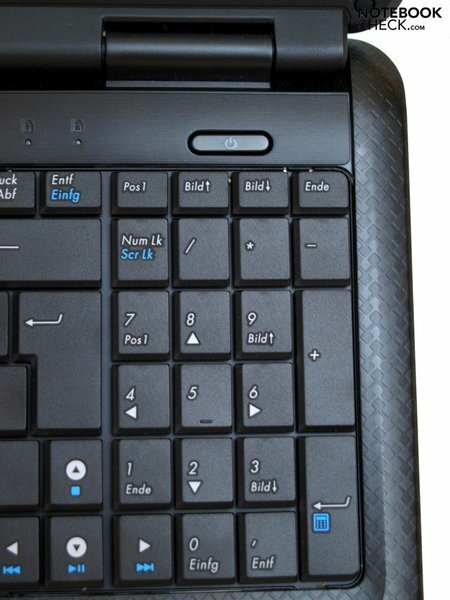 The only weak point is to be found on the base unit in the region of the right wrist rest, which slightly gives way to selective pressure. Picture distortions on a powered-on display can neither be seen in our pressure test, nor through picking up the display from a corner. 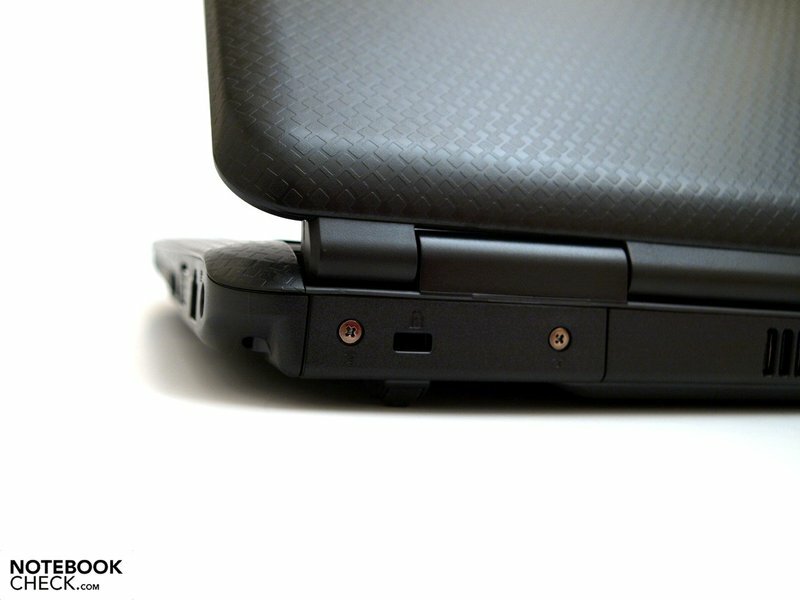 The battery compartment has its own separate cover with a pedestal. 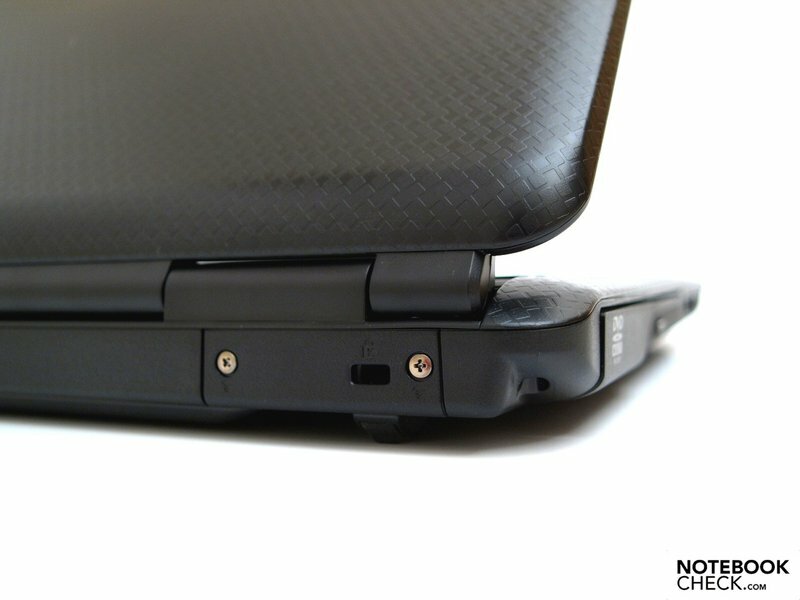 In this way the laptop can be used without the battery so that there's no opening on the underside and so the device doesn't wobble. Unfortunately the cover doesn't sit quite still and can be moved here and there. 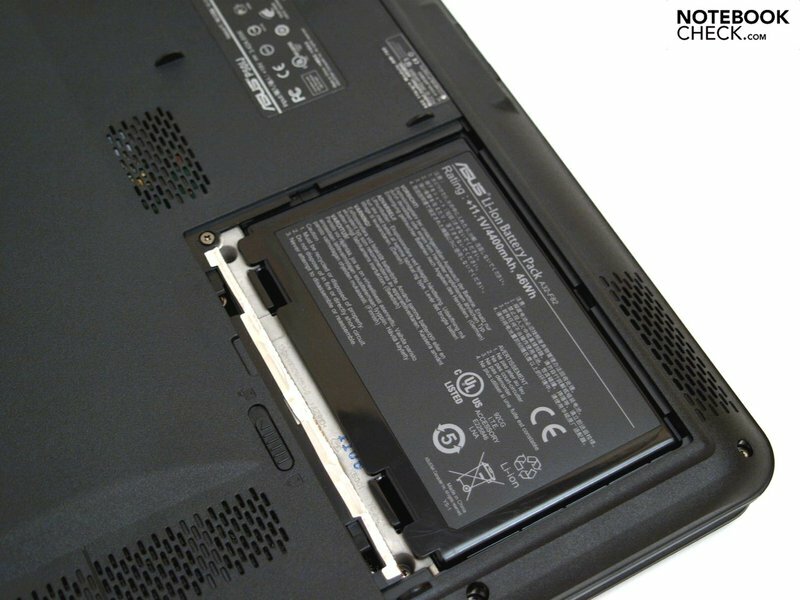 Apart from the battery cover you find no maintenance opening on the underside, thus aggravating, for example, a memory upgrade by the user. Both of the relatively stiff hinges work well and support the display problem-free even in jumpy workplaces (train journey). Nevertheless they can't completely stop wobbling after adjusting the opening angle. This is incidentally limited to a maximum of around 135 degrees. 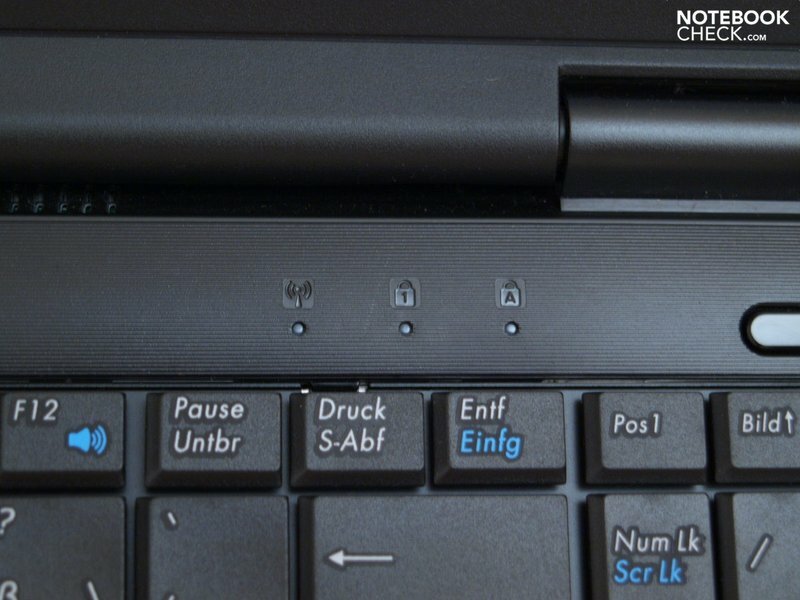 A transport lock is done without, therefore when travelling you should be particularly careful that no foreign objects enter into the gap between the keyboard and display. When it comes to connections the P50IJ offers no more than the most important. 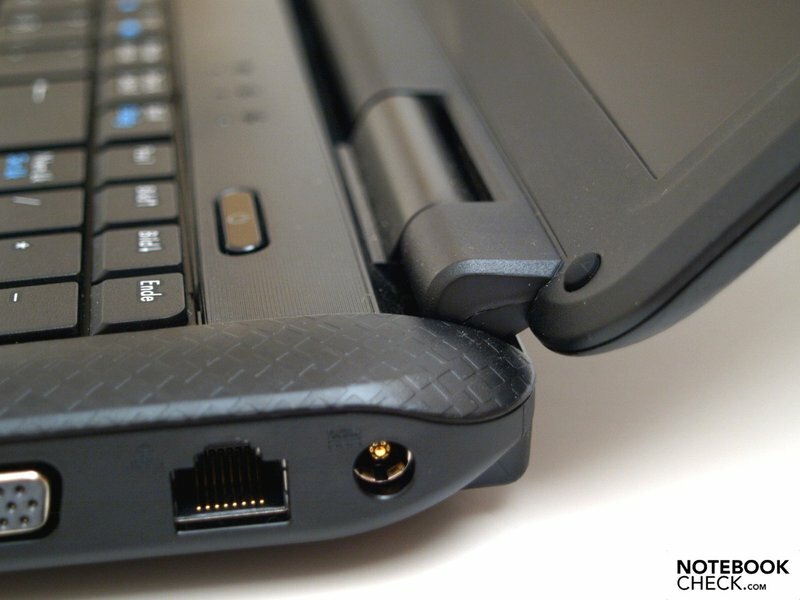 You can search for a docking port in vain, which would have made it easier to quickly connect the device in an existing work environment and which is commonly found in business notebooks. Likewise the user has to make do with a VGA interface for analogue connection of an external monitor. The built-in card reader supports no more than three formats; SD, MMC and MS. Upgrade options via express cards or PC cards are also lacking. The arrangement of interfaces is on the whole satisfactory with a not-too-tight occupancy of ports. Left-handed people can for example use both of the USB interfaces on the right side and vice-versa. When more than two USB devices are connected, left-handed people cannot completely avoid cable-limitations, as two of the overall four USB ports are to be found towards the front on the left side. For right-handed people the audio connections in the middle of the right side can lead to disturbing cables. As for communication modules you'll find WLAN alongside the standard LAN (RJ-45). 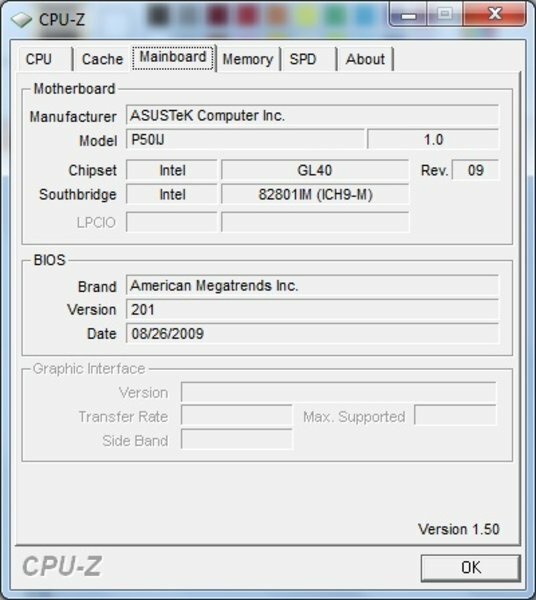 The latter is implemented via an Atheros AR8121/AR8113/AR8114 PCI-E Ethernet controller, whereby according to the manufacturer connections up to 1000MBit/s are possible. The former is implemented via an Atheros AR9285 Wireless Network Adapter. According to Asus, WLAN 802.11 b/g/n is supported. 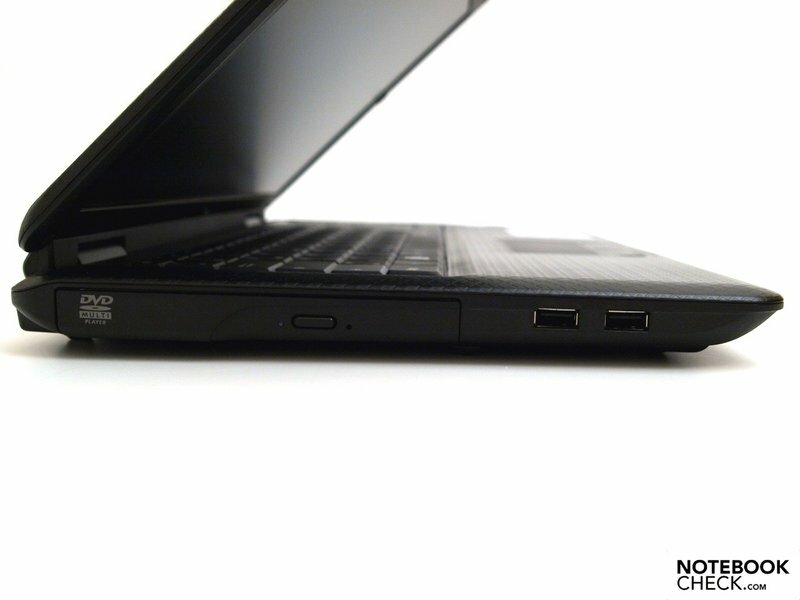 With the built-in 0.3 MP webcam, video-telephony and video-conferences are possible. Nevertheless Asus has not included a Bluetooth module or a broadband modem. If you retrofit the former via a USB modem, already two USB connections (at most) are occupied. On the whole the interface equipment turns out relatively poorly for a 'business' device. Likewise so many potential business customers will miss miscellaneous security features, which are commonly available from the competition, for example fingerprint-reader, TPM, shock-resistant hard disk, splash-proof keyboard etc. That said, to some extent in this price class there are already systems with much better connectivity. 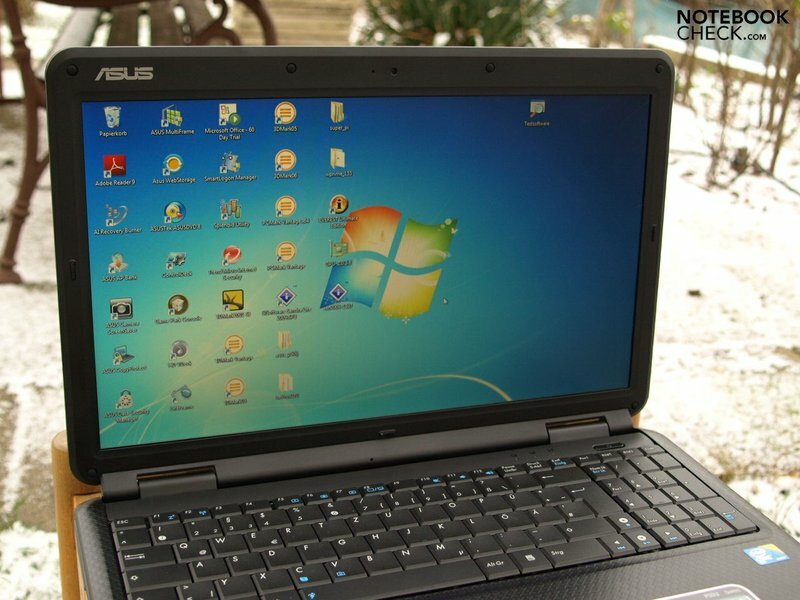 In terms of operating system the device is business-like. Windows 7 Professional 64-bit is pre-installed, whilst a recovery DVD, drivers and utilities media, and an installation DVD for Windows 7 64-Bit are supplied. The pre-installed AI Recovery Tool enables automatic production of recovery DVDs. The standard guarantee covers a year of 'Pick-Up & Return' service. Optionally the time period can be extended to 2 years (battery only 1 year). 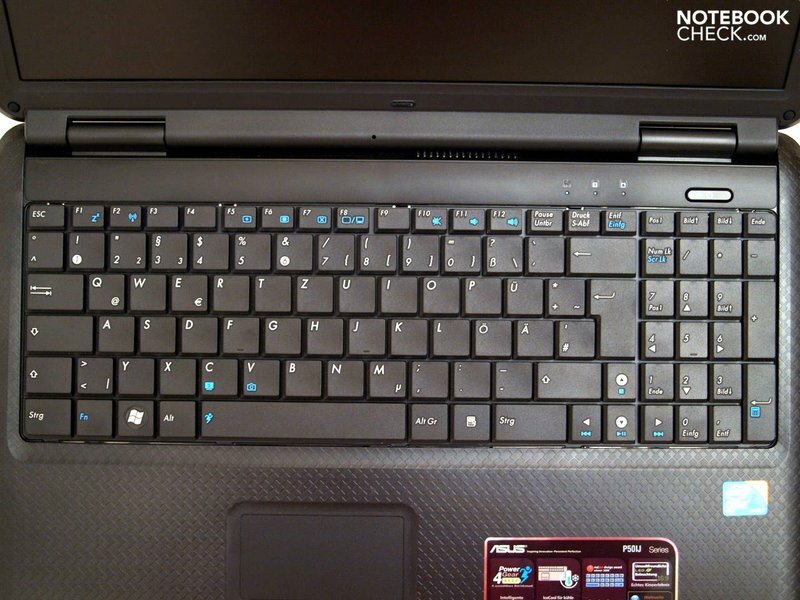 The so-called 'chocolate' keyboard of the Asus P50IJ thoroughly scores points with its 83 keys in standard arrangement. In particular the pleasant feel of the slightly roughened plastic surfaces of the key caps and their slightly concave and ergonomic form. When typing the stroke distance is relatively long and the pressure point could come off more clearly. Thus the typing noise is very quiet. Furthermore, when typing energetically you can notice a spring to the entire keyboard unit. An independent number pad has also found room, which can be activated with 'NumLk'. Nevertheless all keys have a comfortable size. 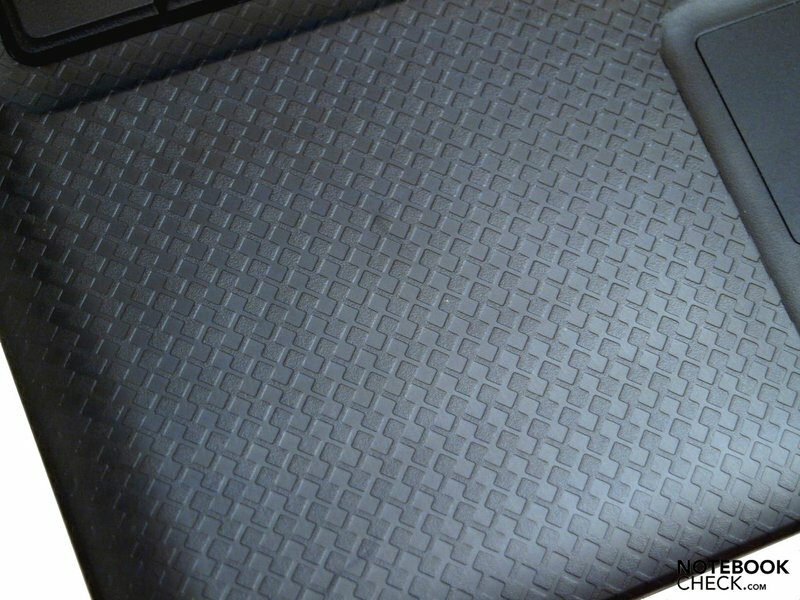 The marginally deeper touchpad isolates itself well from the surrounding case and offers a pleasantly napped plastic surface with good gliding qualities. The built-in mouse replacement allows precise steering of the cursor and responds well. Multitouch gestures or even just scroll regions are not offered. The accordingly matte black keys with a lined texture are obviously mounted centrally, whereby the stroke distance turns out of differing length depending on activation point. The pressure point is clear, the acoustic feedback is almost a bit noisy. 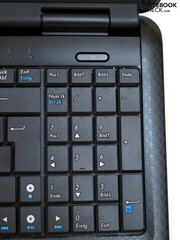 As the touchpad is centered not directly underneath the alphanumerical part of the keyboard, rather offset to the right, it can sometimes be accidentally activated with the right palm. Should you not need it, it can be easily deactivated with Fn+F9. Unfortunately there is no inscription for this on the relevant key and in contrast to the inscribed function keys, you get no visual feedback on the screen. Apropos: no additional keys are integrated, so that all important functions like display brightness, multimedia functions etc have to be executed via FN-key combinations. Also the camera software can be started with (Fn+V). 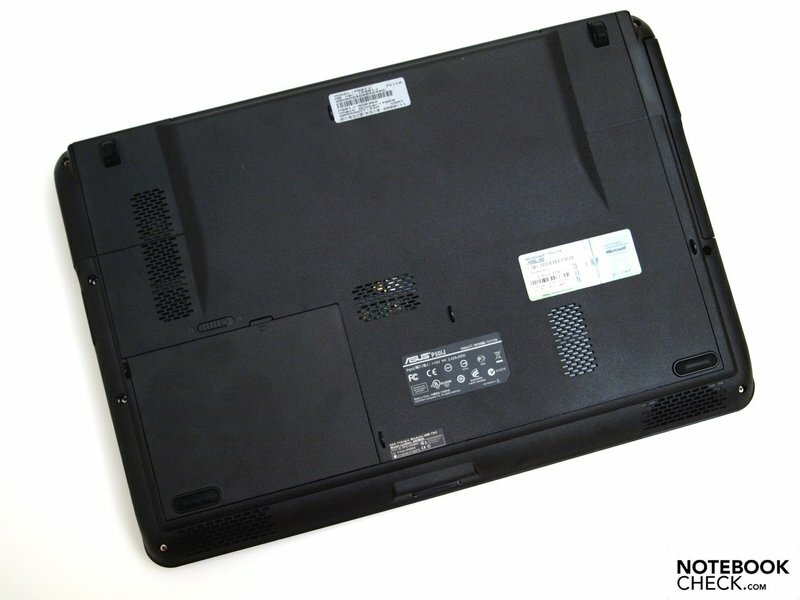 As for the display there's a 15.6-inch HD model from AU Optronics Corp. (AUO), specifically an AUO23EC. 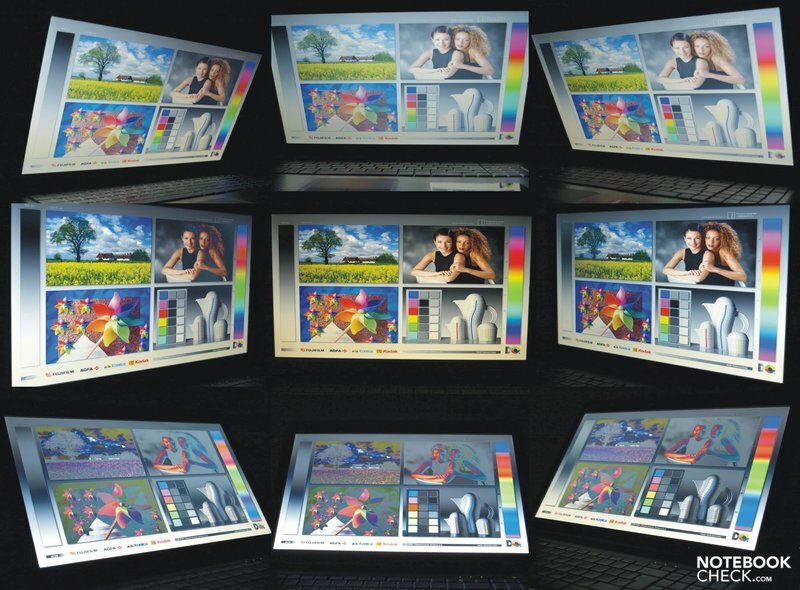 This TFT with LED background illumination offers a native resolution of 1366x768 pixels and thus a cinema-friendly 16:9 format. Indeed this format is practical for border-free playback of films, yet for office applications you would now and then wish for a display with more vertical pixels, as applications like word processors, spreadsheets or internet applications are mostly vertically oriented and in the entry-level business domain these will probably be used more often than DVD films. You can likewise be pleased with the measured data of the display on the whole. The maximum brightness of 212 cd/m² was measured in the central segment of the display. From there the brightness declines at all sides, yet on average there's still 195.9 cd/m² and a minimum of 182.3 cd/m². Due to the maximum and minimum brightness for white there's a good illumination of 86 %. With a rather high black level, the brightness of black measured in the middle segment is 1.16 cd/m², and the maximum brightness in this very place reaches a mathematical maximum contrast ratio of 183:1. In terms of colour presentation, subjectively there are no objections. The colours seem vibrant and natural, despite the surface not being glossy, so that in this case there is no argument for a high-gloss display. In plain white areas you can see practically no shading, as the measured data infers. Likewise black areas are uniformly presented on the display surface, yet black seems rather dark grey, as expected. 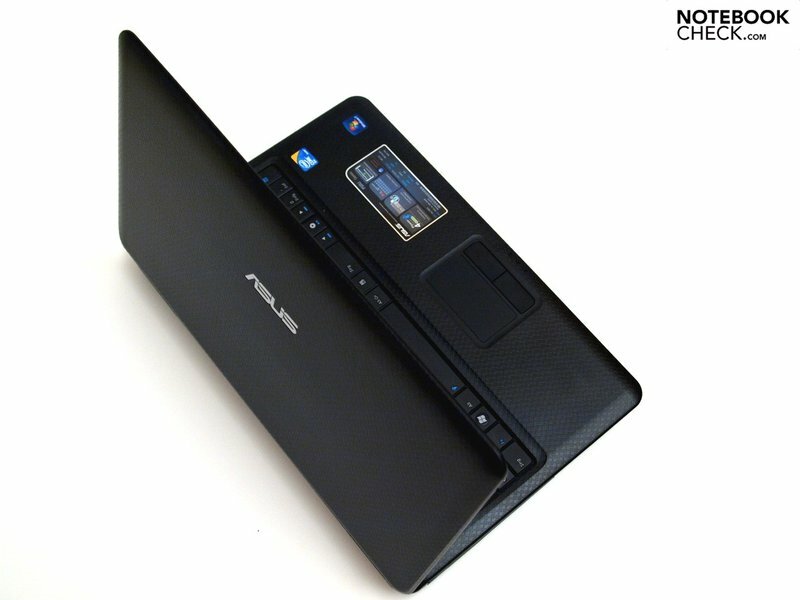 The Asus P50IJ is well suited to outdoor use due to its matte display surface and the good brightness. The photo was taken, for want of an alternative, on a shady winter's day. As you can see in the photo, the contents are easily visible. Direct sun rays on the display might lead you to wish for a little more brightness. The image stability corresponds to an average laptop display. Vertically the stable workspace is rather narrow, so that minor deviance from the ideal vertical angle of the display quickly leads to a loss in contrast. Horizontally the possible workspace reveals itself to be rather generous, so that you can comfortably discuss current business statistics with several people or you can relax with a film in your break. 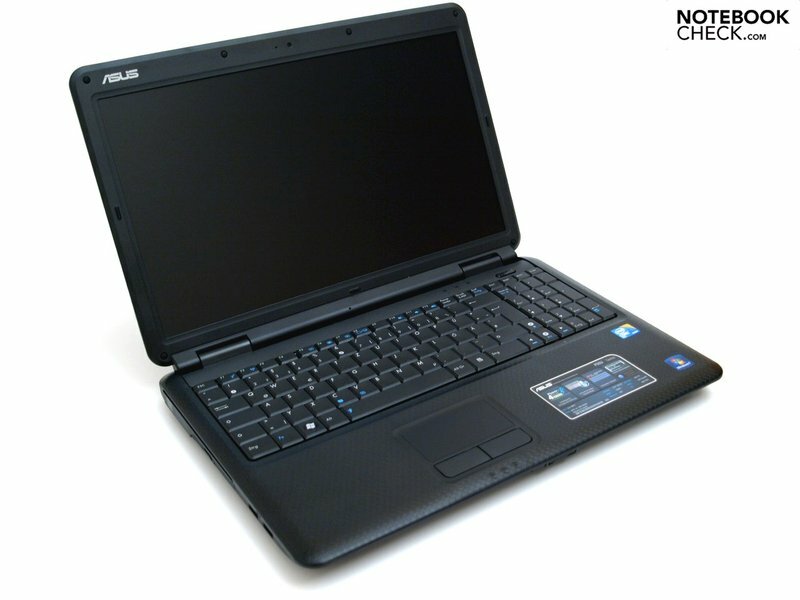 An Intel Core 2 Duo T5870 processor (-> manufacturer information) is responsible for the computing power of the Asus P50IJs. This processor is manufactured in the 'old' 65 nanometer process of Merom CPUs. 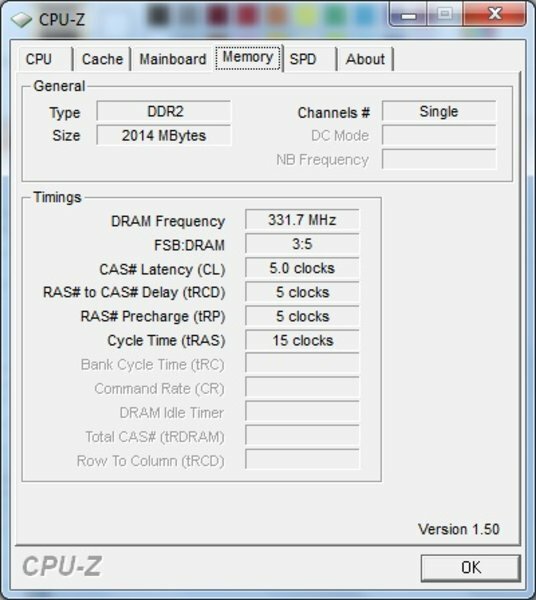 Its technical basic data are 2.00 Ghz clock speed, 2MB Level 2 cache and 800 MHz FSB and a thermal design power of 34 Watt. 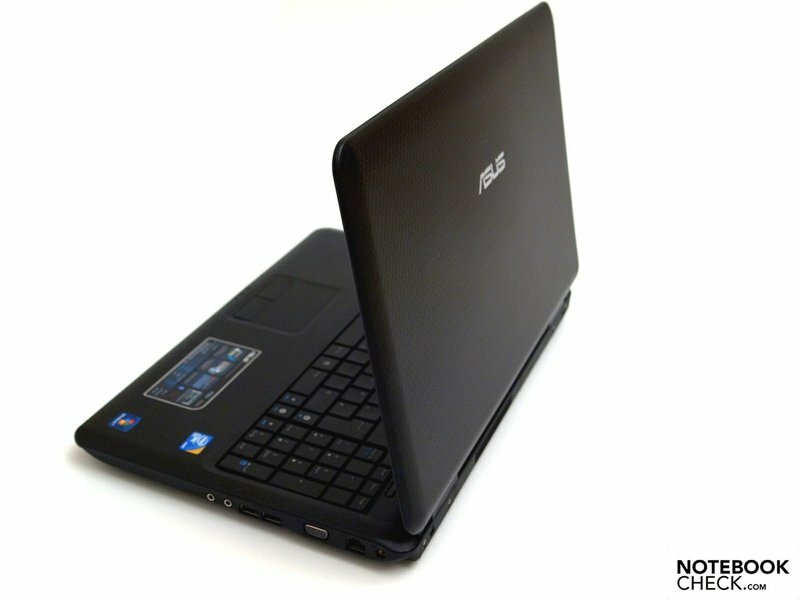 The Asus P50IJ is based on a GL40 chipset from Intel (-> manufacturer information), which integrates a GMA 4500M graphics chip. For this reason, when it comes to graphic performance no leaps and bounds are expected. 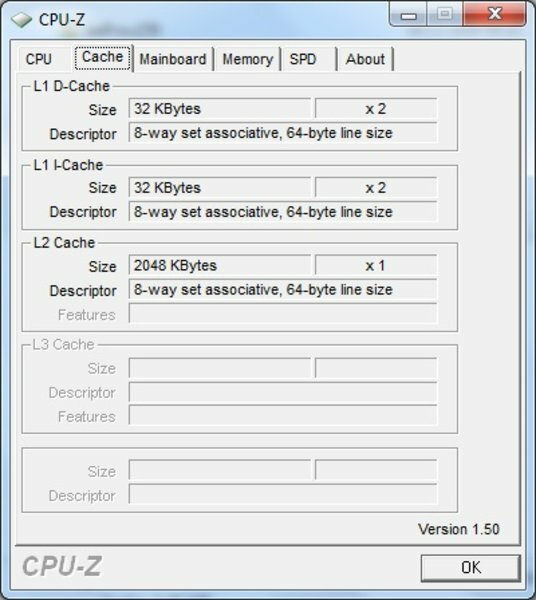 The GL40 chip set supports a maximum of four gigabytes of RAM. 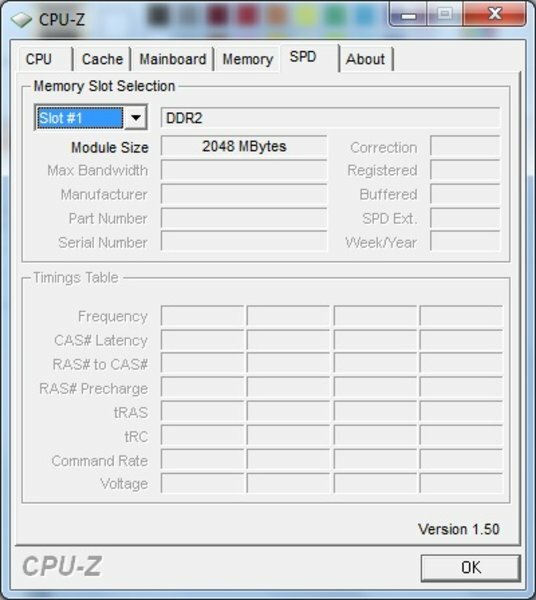 In our test device there was a two gigabyte DDR2 module. An upgrade via another two gigabyte memory stick would be possible, yet the lack of a maintenance hatch makes this not user friendly at all. Overall the system is designed for office and internet applications with this equipment. Outstanding graphic performance for multimedia applications or games cannot be expected. However, should you be interested in games occasionally, refer to our game list. Be careful when connecting external devices. 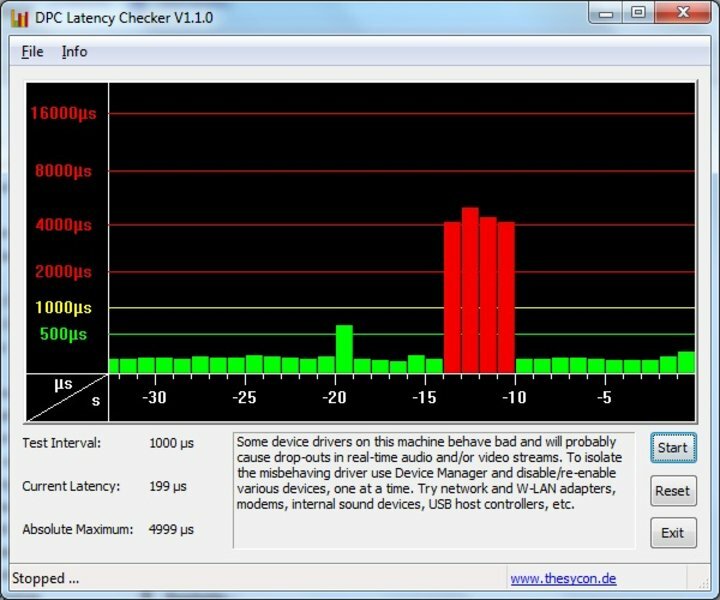 Indeed the DPC latencies remained mostly in the green, yet every now and then outliers of up to 5000 µs could cause problems with the synchronisation of external devices like cracking noises when connecting external audio cards. You should figure out the cause of this problem by deactivating individual drivers, and eventually a driver update will resolve the problem. 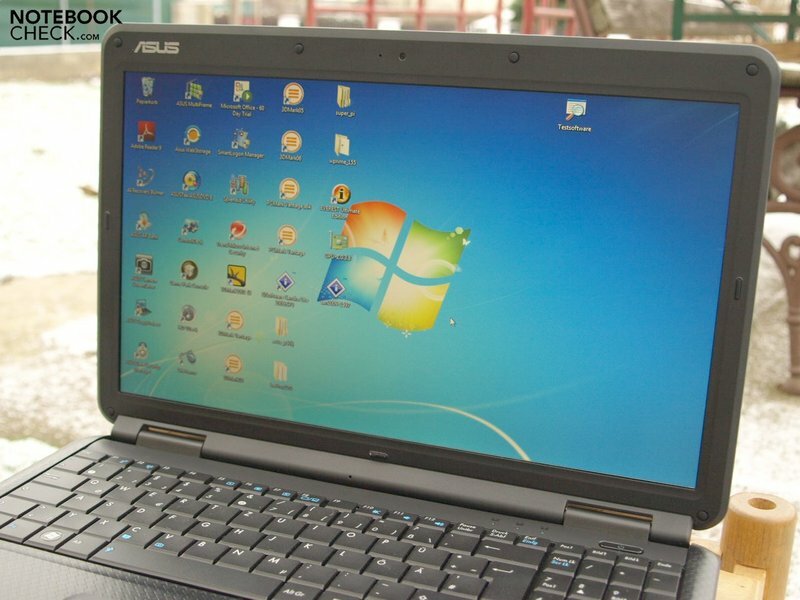 Regarding application performance you can expect a practical office performance on Windows 7. 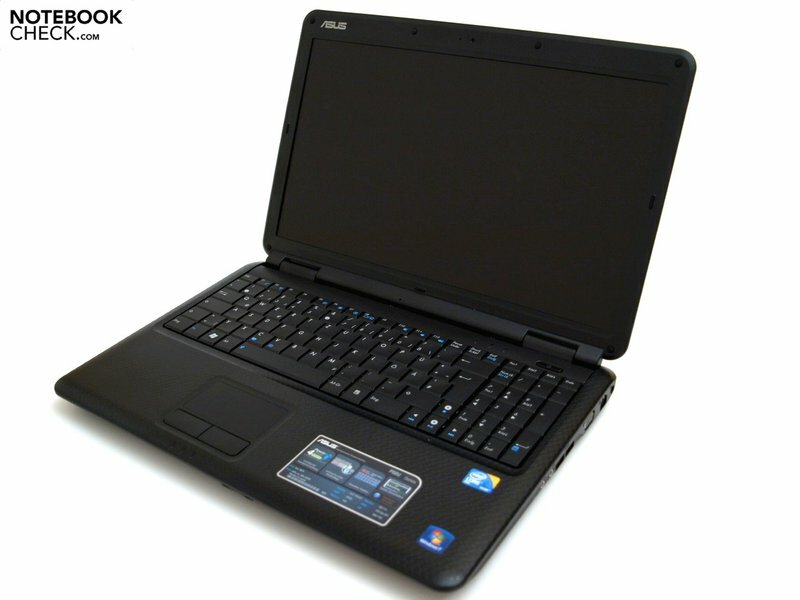 The dual-core processor outperforms single-core CPUs above all when several processes are running simultaneously. And this is in practise constantly the case, if you think of the virus scanners and other memory-resident programs. The PCMarkVantage result and thus the application performance correspond to the expectations of devices with this equipment. It clearly leaves behind similarly equipped devices like the Samsung X520 with a lower clocked SU 3500 single-core processor but double the RAM capacity. 2574 vs. 1674 points means a performance jump of around 53%. 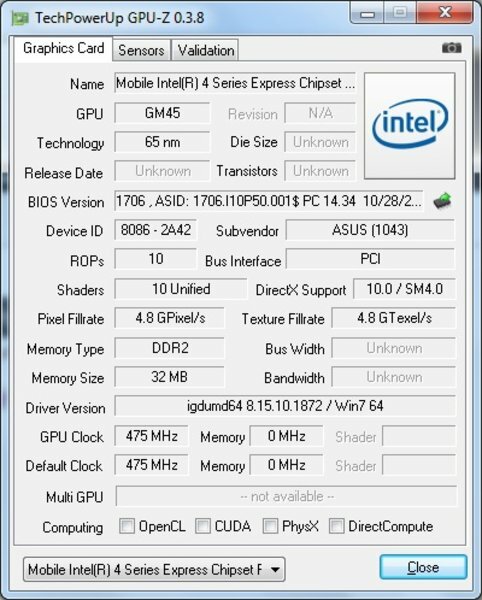 Also the CPU-heavy benchmarks, Cinebench Rendering, 3DMark06 CPU, SuperPi and Wprime fit in well and without surprises in the overall picture. Also the hard disk isn't to be neglected for the evaluation of the overall performance of the system. In our test device there was a HTS545025B9A300 from Hitachi. This offers a net capacity of 250GB and works at a speed of 5400 rpm. The performance values are without surprises (apart from the negative CPU efficiency). As for optical drive, there's an HL-DT-ST DVDRAM GT30N integrated. The system noise remains within limits under full load. At a maximum of 36.8 dB(A) you notice a quiet, yet relatively high-frequency whirring. In idle mode the system noise falls to a minimum of 31.1 dB(A). 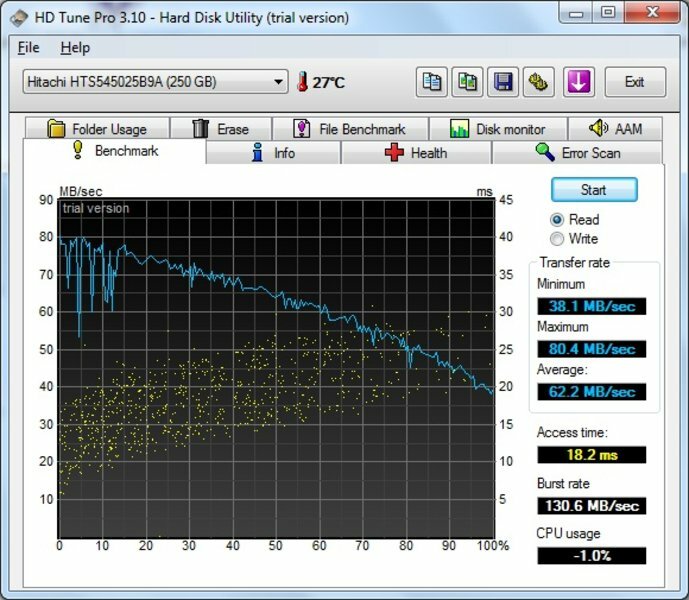 Also the hard disk is relatively quiet at work at 31.3 dB(A). The loudest component is the DVD drive at 35 dB(A) during DVD playback. 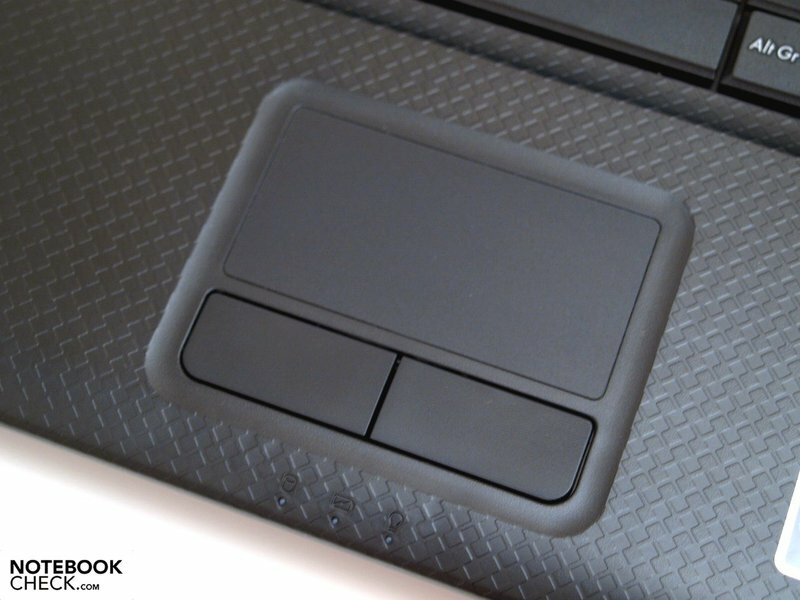 The IceCool Palm Rest design, so-called by Asus, provides the constantly cool palm rest areas, especially with its intelligent placement of the fan. It is successful, as we found out through our measurements. Also after a long period of full load they remained clearly under body temperature with a maximum of 26.8 degrees Celsius. The maximum value on the upper-side of 36.6 degrees Celsius was measured under load on the left rear area. For the underside we noticed a maximum of 39.9 degrees Celsius in the middle rear area. The latter seems rather high for the lap, yet long high-load phases are not usual for a device which is designed for office applications. In idle mode and with maximum energy saving options, the temperature remains clearly under body temperature, whereby the maximum of 30.8 degrees Celsius is reached in the middle segment of the upper side. (+) The average temperature for the upper side under maximal load is 29.5 °C / 85 F, compared to the average of 29.4 °C / 85 F for the devices in the class Office. (+) In idle usage, the average temperature for the upper side is 27.2 °C / 81 F, compared to the device average of 29.4 °C / 85 F.
(±) The average temperature of the palmrest area of similar devices was 28.2 °C / 82.8 F (+1.4 °C / 2.6 F). 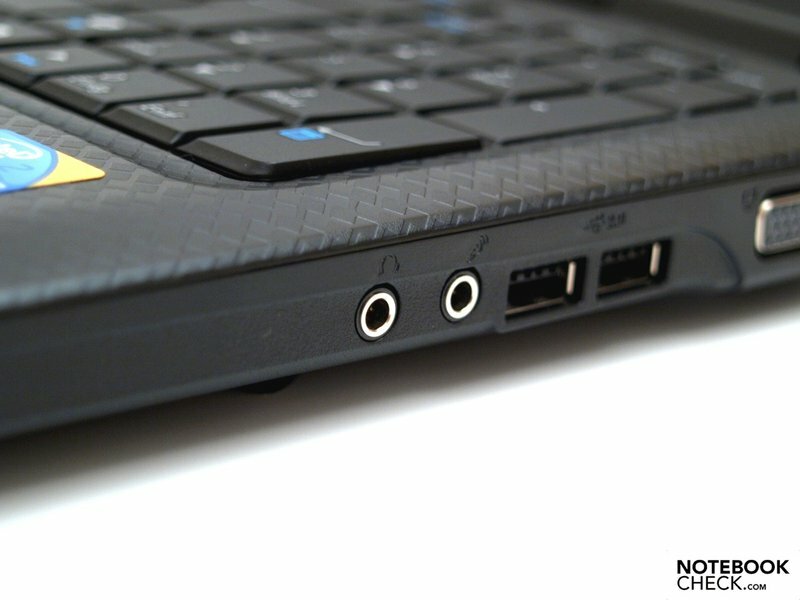 A special sound experience isn't so important on an office device, like it would be on a multimedia laptop. For unambitious background music both of the loudspeakers, on the leading edge skewed towards the desk, are nevertheless sufficient. The sound is full of high tones and, as expected for a device without a subwoofer, low in bass tones. The maximum volume will also only be sufficient for a small room. Use of high-value speakers or headphones brings a clearly audible improvement. 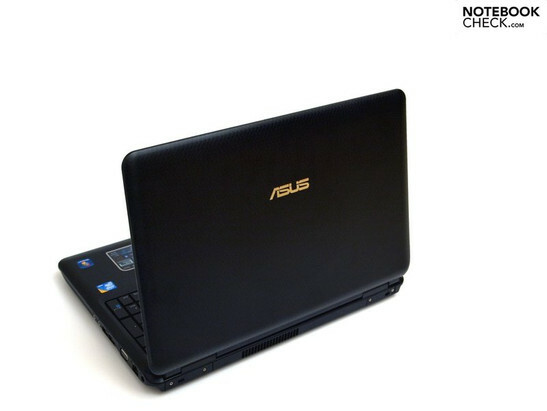 With the 6-cell battery with 46 Wh (4400mAh, 11.1V) capacity, the Asus P50IJ reaches a maximum battery life in the tested equipment of just over six and a half hours. This was obtained with the Reader's Test of BatteryEater Tools with minimum display brightness, maximum energy-saving mechanisms and with wireless off. The minimum, which was obtained by the BatteryEater Classic Test on the maximum performance profile, wireless on and maximum brightness, was just shorter than an hour and a half. 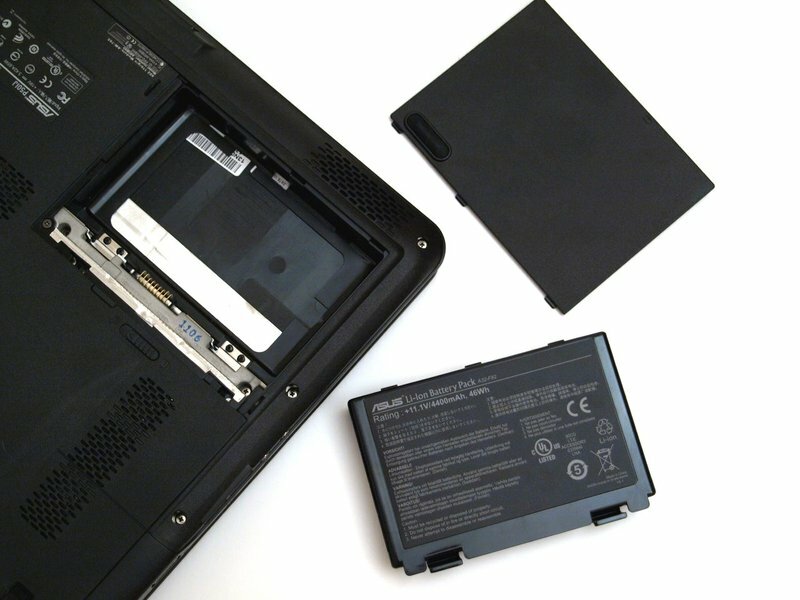 More true to life are both of the battery measurements from use of the laptop. WLAN surfing with maximum brightness and the activated energy-saving profile leads to a battery life of a bit more than 3 hours without a power supply. DVD films are interrupted with an empty battery after around two and a quarter hours. 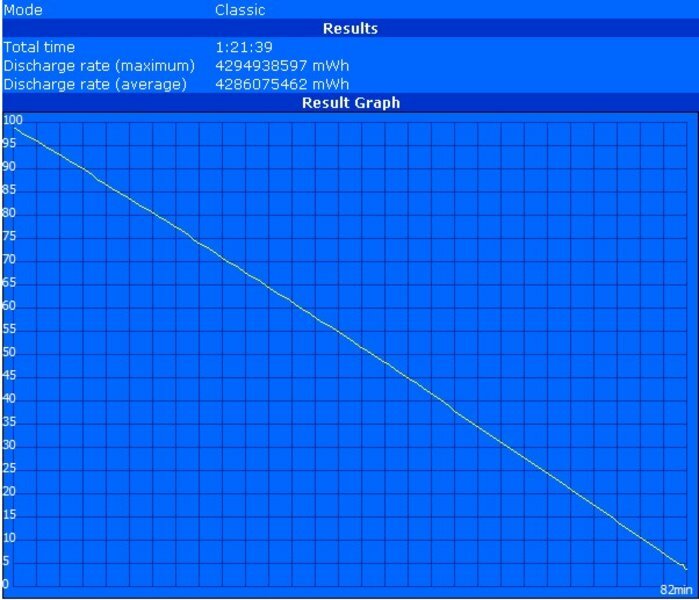 What is particularly positive is the energy consumption of the laptop when turned off: 0.0 Watt. The value for standby of 0.3 Watt is also good. In use the P50IJ needs at least 7.4 Watt and at most 42.8 Watt. With a pre-set screensaver 26.6 Watt, this is even a little more than the device in use with average load. You can confidently do without a screensaver; simply the display can automatically turn off after a preset amount of inactivity, which is better for the environment and economical at the same time. 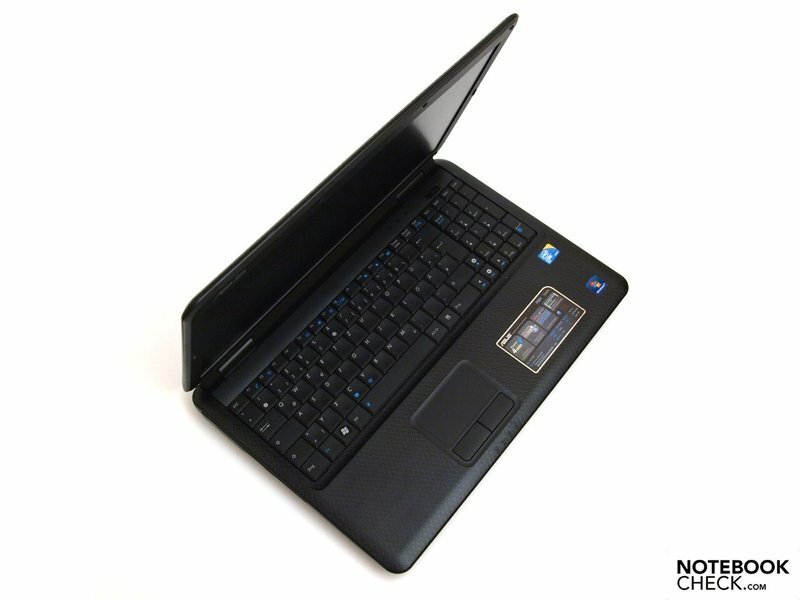 The LED illumination of the display and the integrated graphics chip contribute to energy saving. Through use of an energy-saving processor, the energy required could be reduced further. 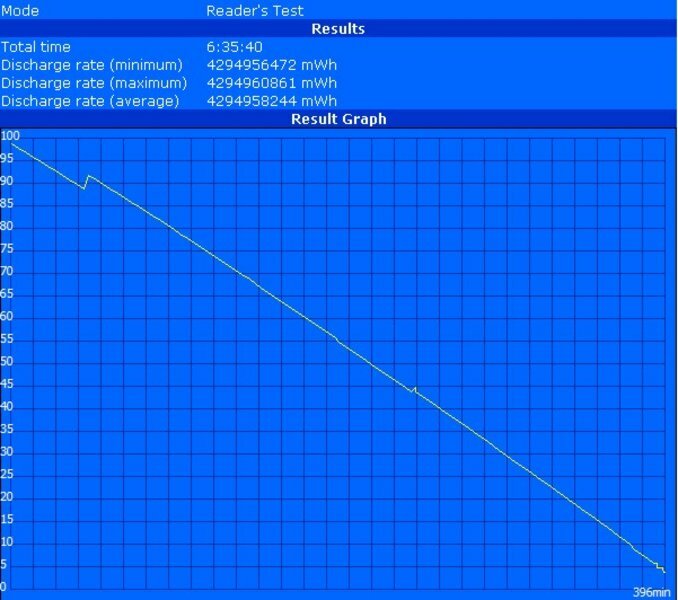 The T5870 after all has a thermal power loss of 34 Watt. 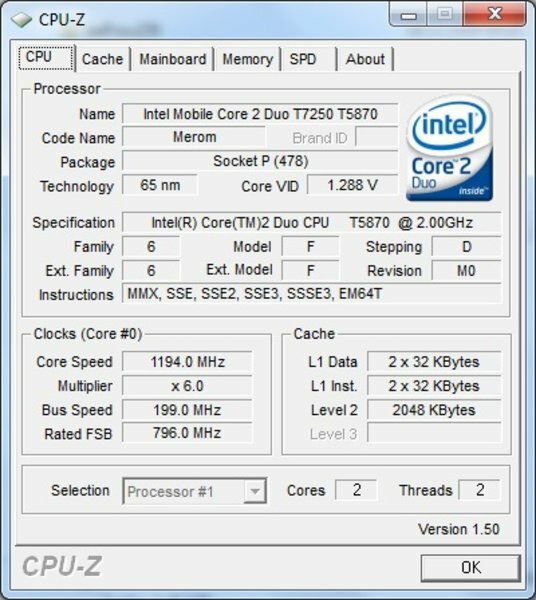 Apart from ULV CPUs that get by with still less, modern Intel Core 2 Duo Pxxx processors only need 25 Watt. 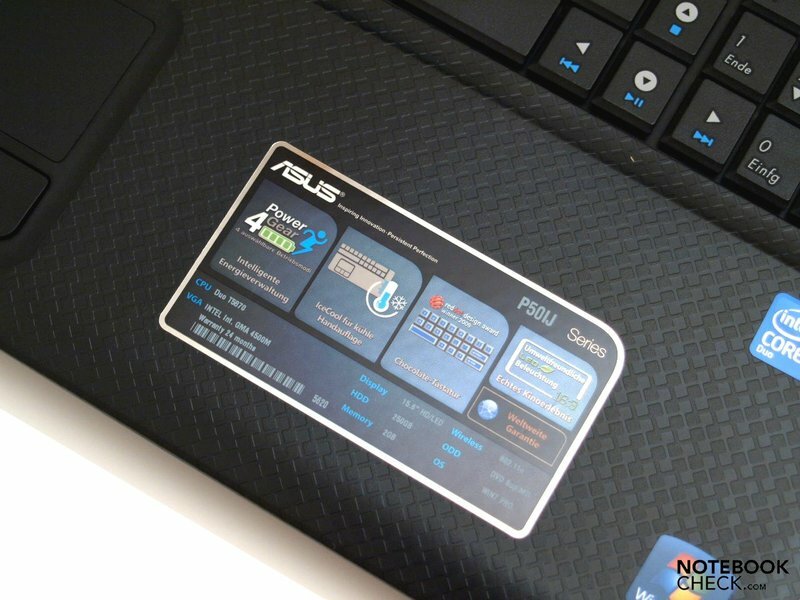 According to its own declaration, Asus has designed the P50IJ for business use. On the outside it conforms through its rather robust, matte black plastic casing. Also the application performance is OK for an office notebook. Graphical high-performance isn't expected from the integrated GMA 4500M. The device doesn't quite keep up with other business devices in terms of connectivity. A docking port for easy connection of the device in an existing workplace would normally be expected in a business device. When on the go, you would potentially want a mobile broadband modem or upgrade possibilities, for example via Express Card. 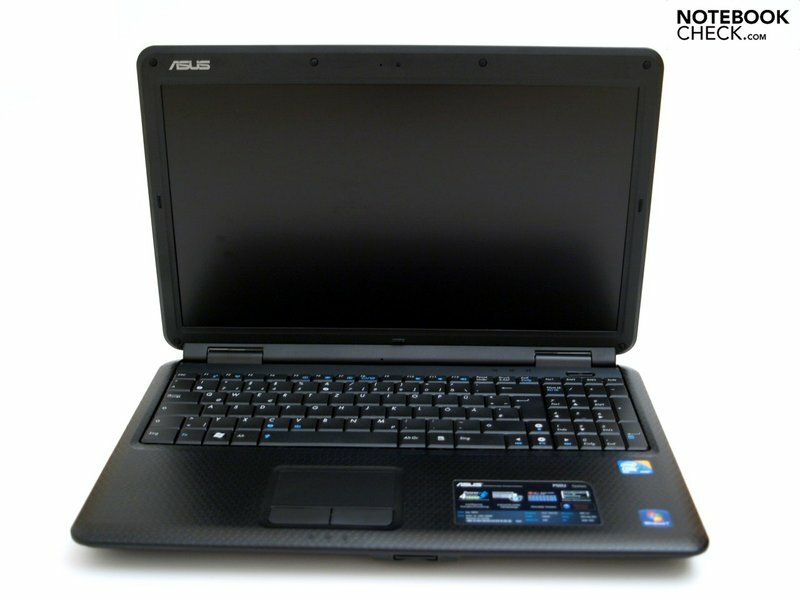 Asus has done without a digital image output, too. Indeed, such an interface in this device class is not absolutely urgent. With the comfortable keyboard and the precise touchpad, which indeed lacks support for multi-touch gestures and scroll areas, you can thoroughly be satisfied. 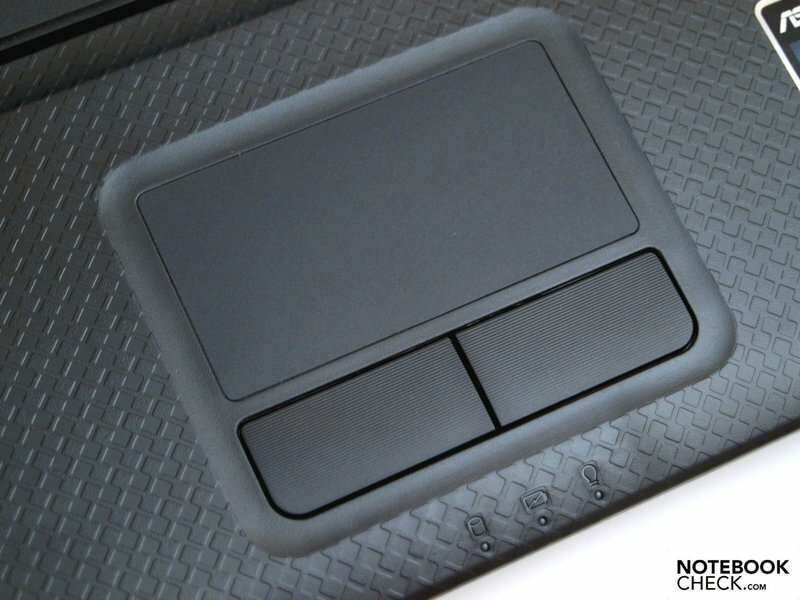 A particular good point is the matte display, which is thoroughly usable outdoors. Here, it's not just the measured results that are convincing. It allows easy-on-the-eye work during a whole work day without disturbing reflections. In addition, the system noise and temperature is within limits. 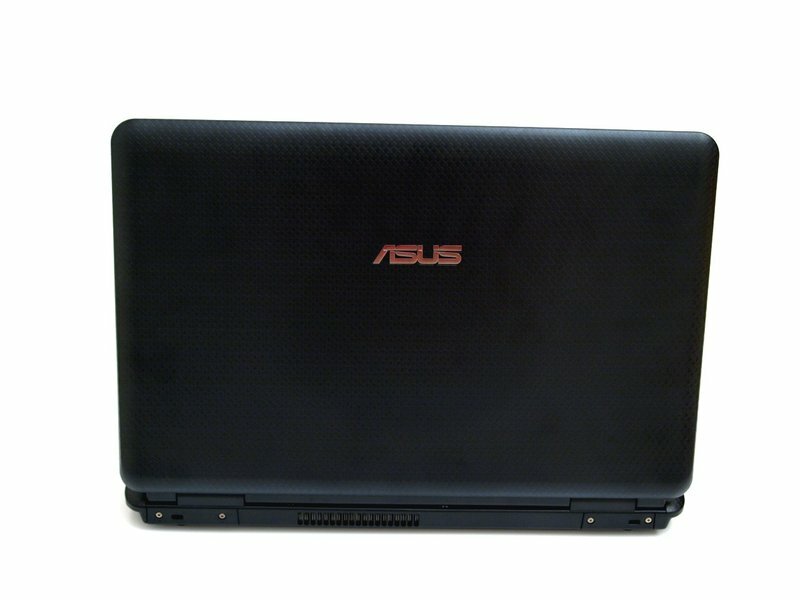 Concerning the price, Asus has succeeded in making a practical office laptop. The main area of use is office and internet applications without particular demands for the graphics. Whoever can do without security features like a fingerprint reader and TPM and can live with the somewhat limited range of interfaces will surely find a credible companion in the P50IJ. ...and, for left-handed people, depending on occupation, the potentially not optimal, two USB ports rather far towards the front. On the right there are probably permanently occupied interfaces like LAN and VGA in the rear. You can search for a digital video output in vain, yet in this device class you wouldn't necessarily require one. 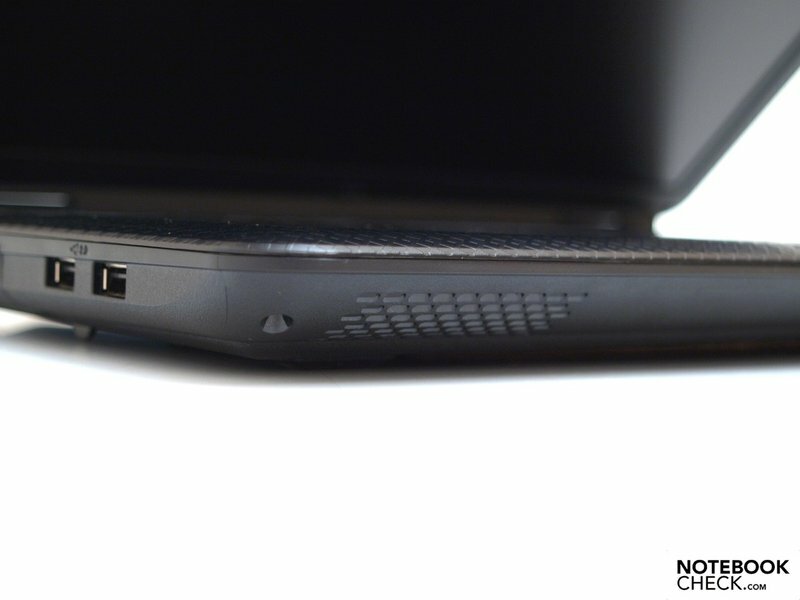 The audio interfaces in the middle of the rear side could also lead to disturbing cables for right-handed people. 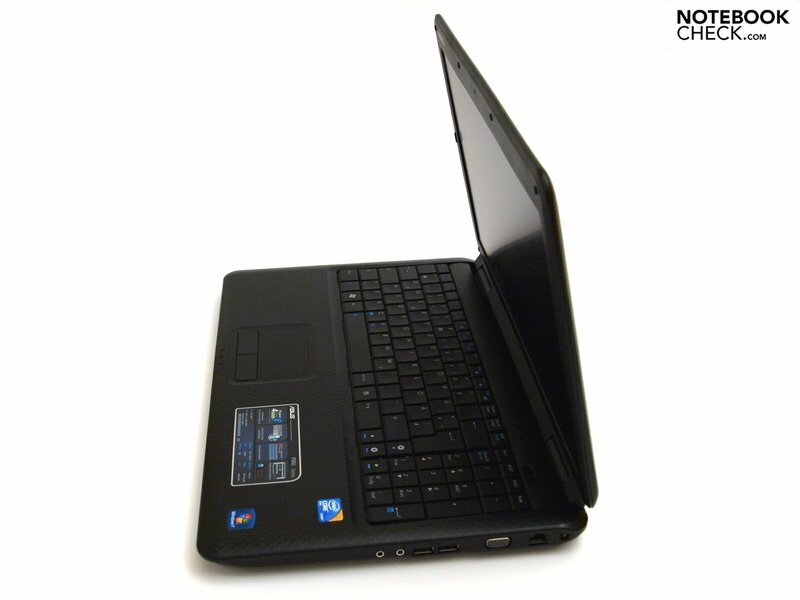 With Intel Core 2 Duo T5870 CPU, 2 GB DDR2 RAM and integrated GMA 4500M graphics chip, the P50IJ has a good application performance. The battery compartment is the only opening on the underside. Without a battery there's no also no opening. The 6-cell 46 Wh battery makes for practical, if not outstanding battery life in the practical tests. ...and the right, on the rear you find no particular security features. Instead of this you could potentially mount a handle here. 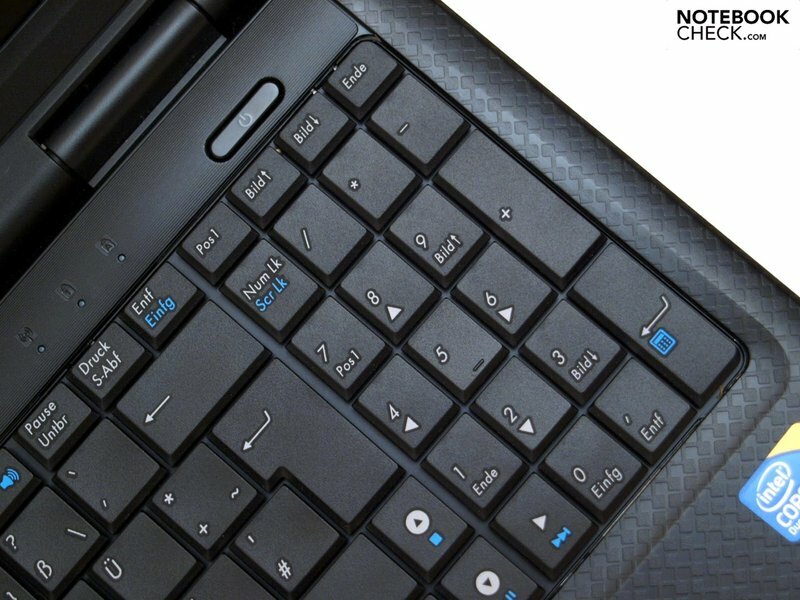 Indeed the touchpad offers no special features, but with its main task, the precise steering of the cursor turns out well. In fact the temperatures and system noise remain relatively low. ... but also on the display lid. The inscription of the status LEDs could, however, have a little more contrast. The laptop scores points with its matte 15.6-inch display with no reflections outdoors or also during professional long-term use. Both of the hinges work well, but limit the opening angle to a maximum of 135 degrees. ...with an extra number pad invites longer typing work. The sound of both of the loudspeakers is excellent for an office notebook but in no way is it particularly good. 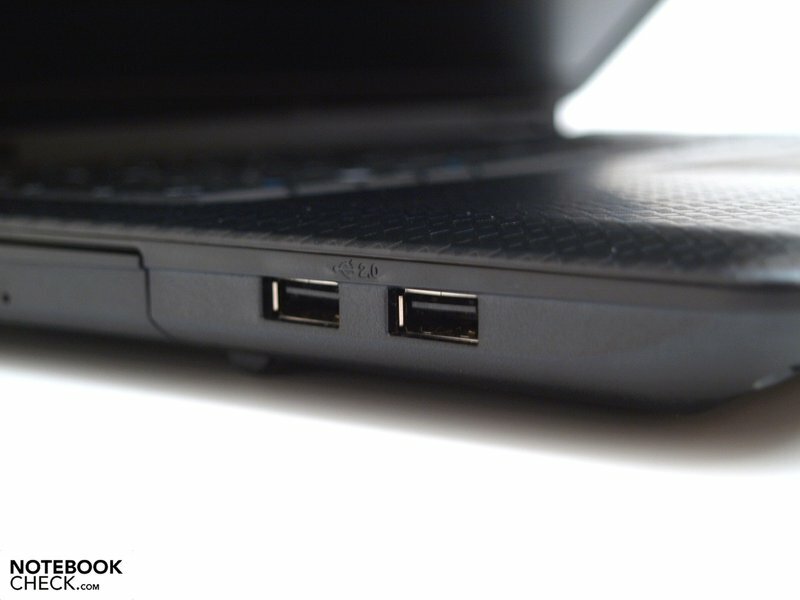 A docking port would be appropriate on a business device. Likewise further communications and security features would be desirable. 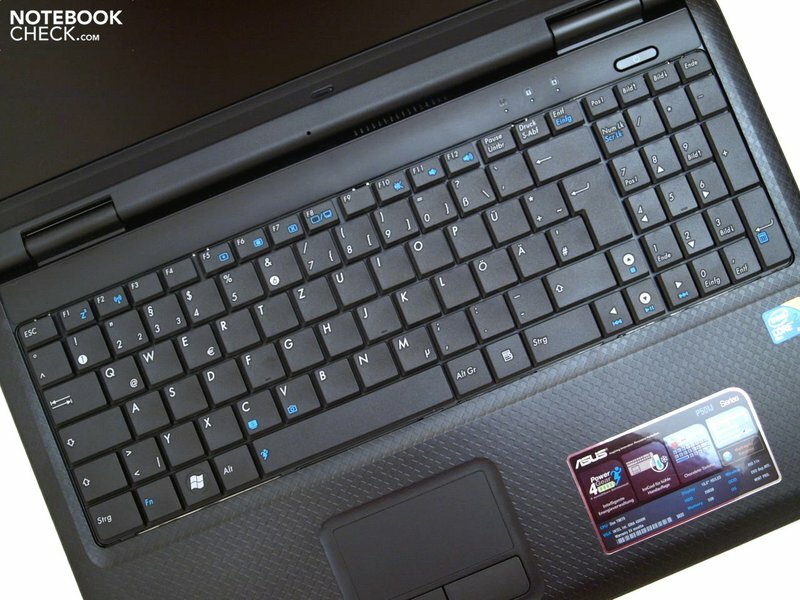 15-inch office device with integrated graphics chip for the entry-level business domain, like the Acer Extensa 5230E or the HP Probook 4510s reviewed by us.